Secretary Hillary Clinton was hospitalized today after a doctors doing a follow-up exam discovered a blood clot had formed, stemming from the concussion she sustained several weeks ago. She is being treated with anti-coagulants and is at NewYork-Presbyterian Hospital so that they can monitor the medication over the next 48 hours, Deputy Assistant Secretary Philippe Reines said. Her doctors will continue to assess her condition, including other issues associated with her concussion. They will determine if any further action is required, Reines said. Clinton, 65, originally fell ill from a stomach virus following a whirlwind trip to Europe at the beginning of the month, which caused such severe dehydration that she fainted and fell at home, suffering a concussion. No ambulance was called and she was not hospitalized, according to a state department official. The stomach virus had caused Clinton to cancel a planned trip to North Africa and the United Arab Emirates, and also her scheduled testimony before Congress at hearings on the attack on the U.S. consulate in Benghazi, Libya. According to a U.S. official, the secretary had two teams of doctors, including specialists, examine her after the fall. They also ran tests to rule out more serious ailments beyond the virus and the concussion. 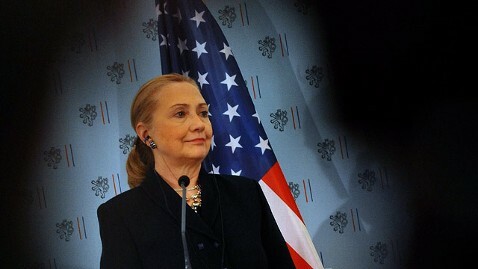 During the course of the week after her concussion, Clinton was on an IV drip and being monitored by a nurse, while also recovering from the pain caused by the fall. Medical experts consulted by ABC News said that it was impossible to know for sure the true nature or severity of Clinton’s condition, given the sparse information provided by the State Department. However, most noted that the information available could indicate that Clinton had a deep venous thrombosis,which is a clot in the large veins in the legs. “A concussion (traumatic brain injury) in itself increases risk of this clot. Likely the concussion has increased her bed rest,” said Dr. Brian D. Greenwald, Medical Director JFK Jonson Rehabilitation Center for Head Injuries. “Immobility is also a risk for DVT. Long flights are also a risk factor for DVT but the recent concussion is the most likely cause. “Anticoagulants are the treatment,” he said. “If DVT goes untreated it can lead to pulmonary embolism (PE). PE is a clot traveling from veins in legs to lungs which is life threatening. Many people die each year from this. Dr. Allen Sills, associate professor of Neurological Surgery at Vanderbilt University Medical Center, said it was most likely that the clot was not located in Clinton’s brain, since she is being treated with anticoagulants. “This is certainly not a common occurrence after a concussion, and is most likely related to either inactivity or some other injury suffered in the fall,” he said. Dr. Neil Martin, the head of Neurovascular Surgery at the University of California, Los Angeles, Medical Center, said blood thinners are often given for blood clots in the legs, and it is “very unusual” for anticoagulants to be given for blood clots in the head. But he cautioned about speculating too much about Clinton’s condition before more information is available.